Lovely small white cat eating.Sheis white with grey shadows.. Stamped "Elastolin", Germany.Made of composition.Size h.2 1/2 cm/ 1". Long 5 cm/ 2" A cute pet for your dollhouse r dolls.. Fine condition all over. Lovely small white cat with stribes.She is sitting. 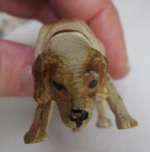 Germany.Made of composition.Size h.4 cm/1 1/2" A cute pet for your dollhouse or dolls.. Fine condition all over. Lovely small white/brown dog with bending head, with band arround his/her neck. Germany.Made of composition.Size h.5 cm / 1 3/4". Long 9 cm/3 1/4"" A cute pet for your dollhouse or dollhouse garden. He will watch! Fine condition all over, a small line to the tail and leg. This is no brake-only a hairline in the upper lay material due to age and minor to the appereance of this fine animal.